Exeter, NH – The Worcester Railers HC scored three power play goals to defeat the Maine Mariners by the score of 5-0 in ECHL exhibition play at the Rinks at Exeter, NH on Saturday evening in their only exhibition game before the regular season. The Railers kick off the regular season with a pair of games in Reading, PA vs. the Royals on Oct 13 and 14 before returning home on Oct 20 at the DCU Center vs. the Mariners. The Railers charged out to a 2-0 first period lead as rookie Even Buitenhuis made 12 saves in net for Worcester. Veteran Josh Holmstrom (1st) made it 1-0 on the power play after Portland netminder Brandon Halverson tried to clear the puck and hit Holmstrom in the chest and the puck ended up in the empty net at 11:54. Less than a minute later, Barry Almeida (1st) buried a loose rebound past the Portland goalie assisted by Tyler Barnes and Nick Sorkin at 12:46. Shots were 12-10 in favor of Portland through 20 minutes of play. Barry Almeida (2nd) ripped home a power play goal at 12:55 of the second period assisted by Ryan MacKinnon and Tyler Barnes to give Worcester a 3-0 edge through 40 minutes of play. Buitenhuis made 20 saves through 40 minutes before being replaced by Charlie Millen at the start of the third period. Worcester killed off a lengthy 5-on-3 power play midway through the third period to keep the Mariners at bay. Nick Sorkin (1st) would tack on another power play marker after a nice pass from David Quenneville at 15:23 to give Worcester a 4-0 lead. Trent Durocher (1st) went bar down at 17:48 with a rush down the middle to close out the scoring. Charlie Millen made 11 saves in net in the third period as Worcester took home a commanding 5-0 exhibition win to close out training camp. 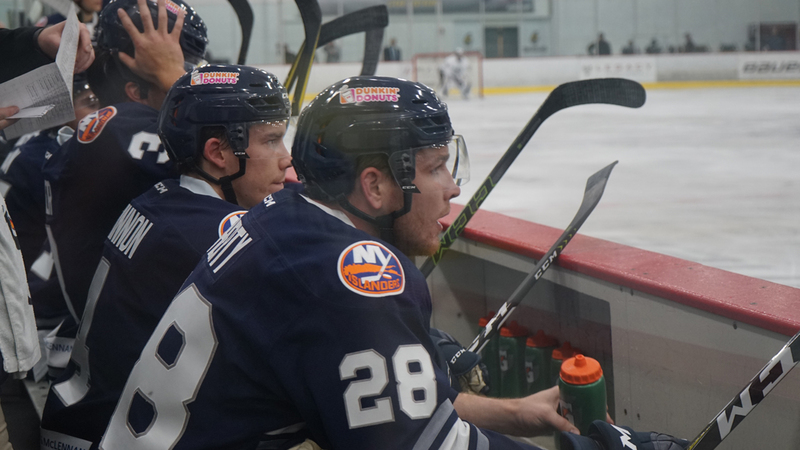 Notes: Three Stars: 3rd star Nick Sorkin (1-1-2) 2nd star: Evan Buitenhuis (20 saves, Win) 1st star: Barry Almeida (2-0-2)….Final shots were 39-31 favor of Worcester… Brandon Halverson (0-1-0) made 25 saves on 28 shots for Maine in 40 minutes of play, Connor LaCouvee made 9 saves in relief….Evan Buitenhuis (1-0-1) made 20 saves on 20 shots for Worcester in the first two periods while Charlie Millen made 11 saves on 11 shots in the third period.….Worcester went 3-for-8 on the power play while Maine went 0-for-5…. Tommy Kelley (inj), Tommy Panico (inj), Mitch Gillam, Mike Cornell, Tyler Mueller, and Ryan Hubbard did not dress for Worcester…. Barry Almeida and Josh Holmstrom each wore an “A” for Worcester…Tommy Tsicos and Nick Bligh also added assists for Worcester…Josh Holmstrom led all skaters with five shots on goal. On Saturday, Oct 13, the Railers begin their 72 games regular season schedule with a 7pm start in Reading, PA vs. the Reading Royals. The Railers battle the Royals again on Sunday, Oct 14 at 3pm. On Saturday, Oct 20 the Worcester Railers HC host the Maine Mariners at 7:05pm on RAILERS 2.0 OPENING NIGHT! The first 7,500 fans will receive a Railers magnet schedule courtesy of the Worcester Telegram and Gazette. One of the most popular entertainment acts in all of professional sports will perform…..the QUICK CHANGE magic act featuring David and Dania as seen on America’s Got Talent! Doors will open early at 5:30pm at the DCU Center and fans are encouraged to be seated by 6:50pm for the opening night pregame show. Tickets start as low as $15!